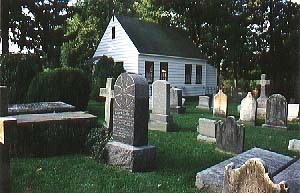 The Carroll Chapel cemetery in Forest Glen, Maryland, is in the parish of St. John the Evangelist in the Rock Creek area of Washington D.C. and Maryland. This cemetery is on land that at one time belonged to Eleanor Darnall Carroll, 1703-1796. She had the chapel built on the land where she lived for one of her sons, John Carroll, later to become Archbishop Carroll. John lived with his mother and was supported in his religious endeavors by his brother Daniel Carroll II, signer of both the Articles of Confederation and the Constitution. The cemetery, next to the site of the original chapel, is still there in Forest Glen and many Carroll and Brent family members are buried there. Robert Brent, 1763-1819, 1st mayor of Washington D.C.
Photo of the Carroll Cemetery Chapel and cemetery at Forest Glen taken by John A. Fox and used with permission. The photo appears on the Knights of Columbus web page about Father Rosensteel and the Carroll Chapel, www.kofc-2169.org/couhist.htm. The building in the photo is a replica of the original Carroll Chapel, built for Archbishop John Carroll by his mother, Eleanor Darnell Carroll.